Suiseki are often displayed in a tokonoma, a traditional Japanese method of display. The tokonoma usually contains one suiseki plus 1-2 other objects, chosen and combined with great care. The Japanese hanging scroll, placed on the back wall of the tokonorna, depicts a Japanese painting or poem relating to the suiseki and to other display items. Without duplicating one another, all objects in the tokonoma should be harmonious for a simple and peaceful effect; they should also reflect the current season. 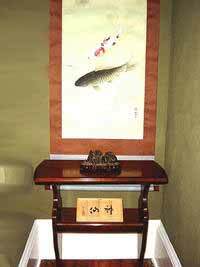 Today, drawings or photographs are sometimes used in place of the traditional Japanese scroll. In addition, some western collectors have used music, lights and fragrances to create the desired atmosphere.